What does it take to be a great adventurer? Bear Grylls just became a spokesman for Triumph. He’s a great adventurer. You know the type: fearless, multi-talented outdoorsman, skins live snakes, never sleeps by the same river twice, dashing and completely unhinged. Most of us aren’t that person. Most of us have responsibilities like work that allows us to make bike payments, along with a honey-do list that never seems to get shorter. On a good day we can squeeze in a clandestine viewing of the Sons of Anarchy between mowing the lawn and staining the fence. Many, many riders have repressed a primal desire to drop everything and head into the hills - forever. Yet, so powerful is that impulse, that ignoring it will quite literally make you blind. 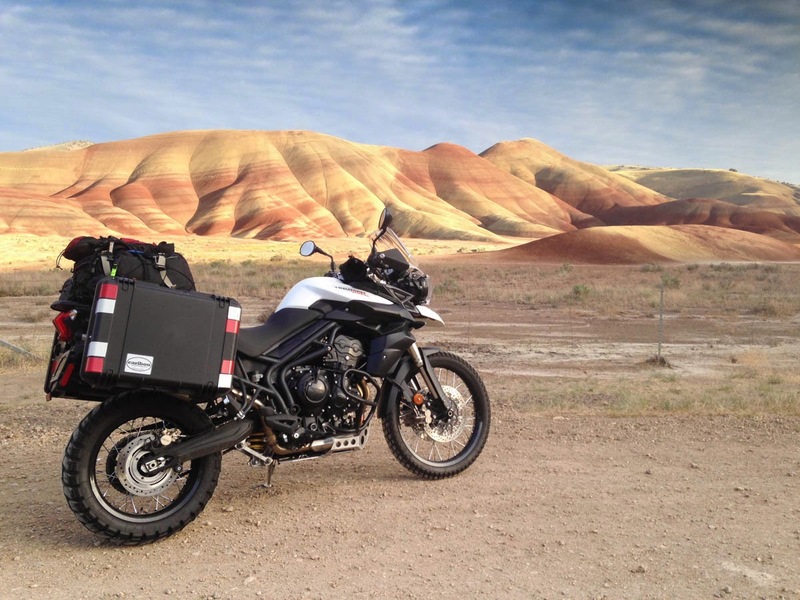 The good news is that not every motorcycling adventure requires you to sell your house, quit your job and commit to two years of the squits in some fly-blown backwater. Sometimes the best adventures require only a long weekend in your own backyard. Especially if your backyard is Oregon. My Tiger 800XC, Lily (you named your bike, right? ), and I left Portlandia for the wilderness somewhere east of the Cascades. It was mid-June. 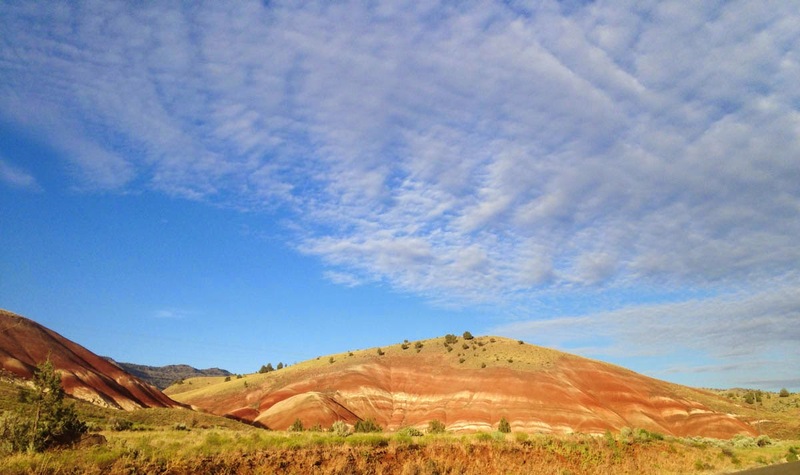 Our only goal was to find new roads and explore the John Day Fossil Beds - a place whose very name exudes discovery. We headed out on state highway 26 towards Mount Hood and the Barlow Pass where we’d turn right and head southeast towards Shaniko, a real live ghost town. Standing an hour outside Portland, Mount Hood is the most climbed peak in the United States. It’s easy to forget it’s there, covered as it is by clouds for so much of the year. But on this day the clouds parted around noon and sunshine lit up Hood’s brilliantly snow-capped peak in all it’s glory. By now most of the highway’s winter grit had been swept aside and things were drying out. Nevertheless at several turns along the winding road enough cold air swelled out of the woods to fog my visor. The road forked just outside Government Camp, turning south and then due east at the next split. As we descended, the dense forest of Douglas Firs on the mountains gave way to thinner stands of Ponderosa pine in the foothills that eventually opened out onto broad, seemingly empty grasslands. The little town of Maupin’s claim to fame is as one of the main put-in points for rafters heading down the Deschutes river. It’s quaint with lots of coffee shops and outfitters. Not sure when I’d find gas again I looked for a top up on Google maps, but I was buggered if I could find the gas station. It was then I began to realize that gas was going to be a challenge - out here where the distances between towns really stretch out - so I started keeping a more watchful eye on my fuel gauge and odometer. A couple of sharp turns plopped me down by the river, then a couple more brought me up into my third ecosystem of the day. Prairie rolled away on either side of me, interrupted only by the occasional crags and rocky red outcrops at the very top of the river gorge. With the mountains fading into my rearview mirrors, the view in front of me was pure Kansas. Shaniko, isn’t completely abandoned. Besides the old hotel and dilapidated, weatherbeaten barns, there’s a small antique emporium with a deli manned by a fellow who makes a damn fine turkey sandwich. After I ordered I wandered around the bric-a-brac and chatted briefly with a woman about my age, only she was in better shape. “How do you pronounce this town's name?”, I asked, “Shan-nee´-ko? Shan-eye´-ko?” “Shan´-i-ko,” she said, “and it's not really a ghost town. Bodie, California is a real ghost town. Now that's a place to visit. It's a state park now. You can 't go in the buildings anymore because people stole things in the early days. I miss California.” She looked past me, out the door to the south, a little wistfully. Quaint as it was, Shankio has no gas. Just an abandoned garage with a rusting set of pumps. “There’s a guy up the road selling cans of gas for $10 bucks a gallon if you need it.”, the deli guy said. Since the wind had been behind me most of the day I did the mental math and decided to continue south to the county seat, Madras, instead. Madras is so big, even Safeway has gas there. My rough plan called for the John Day Painted Hills that night, which meant I had another couple of hours riding ahead of me. 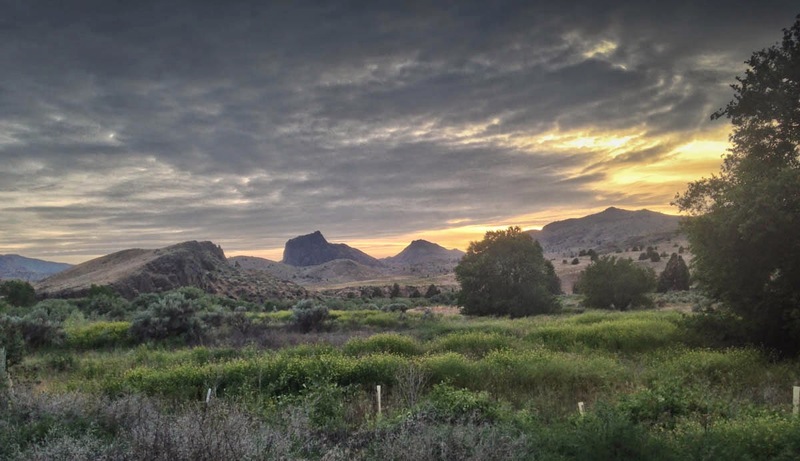 When a big sign said, ‘Welcome to the Crooked River National Grasslands’ I had to fight the temptation to simply get off the highway and explore the beautiful rolling hills. Instead I made a note to myself to come back when I had time do them justice. Slowly the road rose and for the next 30 miles wound its way up through the Ochoco National Forest. Finally at an elevation of 4,100’ the Ochoco Pass tips over and you find yourself gliding down big sweepers and gentle twisties into what I later learned was the original west coast of America. Canyons rose up in front of me and hills dead-ended the road. At the last minute sudden hairpin turns tracked alongside the river and my route weaseled its way through the folds in the earth. I wasn’t in Kansas any more. John Day Painted Hills Unit that way the sign indicated. Turning off the highway as the sun dropped, the golds and greens of the scrubland steadily intensified. A couple of small knolls three miles in were just an overture to the layered symphony that are the Painted Hills. Pavement gave way to gravel at the entrance to the state park where visitors are treated to a sweeping view of the multicolored hills in a wide natural amphitheater. Like a wedding cake, each layer is distinctly separated by a fossil rich limestone frosting. It was about 7:30PM and golden hour was almost on us. Humbled by my surroundings and feeling more than a little insignificant in the face of millions of years of geological history, I spent a quiet hour wandering the trails taking pictures. Long shadows drew in and over me as the day’s hues shifted darker. A knot that had sat between my shoulder blades all week quietly unraveled as I unconsciously relaxed. Ten miles further up the trail I found a Bureau of Land Management campsite alongside the John Day River. A steep winding track dropped me into the Land That Time Forgot. Big, fist-like projections of basalt and groves of deciduous trees lurked under the overhang of the tall cliffs surrounding me. I was nervous that Doug McClure and a couple of T-Rex’s were going to jump out at any minute. The night was clear and cool and most of all quiet. I slept soundly. ©2015 Red Thread Adventures. Powered by Blogger.